The compact drop-in Variable Flow Mixer Model 2900 accommodates a turn down ratio of up to 20-1 in liquids or gases by incorporating two of Westfall’s signature plate mixers. The mixer provides a faster, better and often more economic choice for mixing and blending while providing constant headloss. 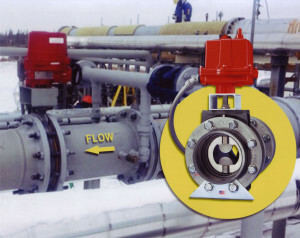 The upstream plate remains stationary while the downstream plate pivots as it adjusts incrementally to changing flow conditions. 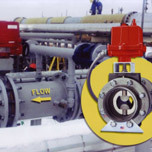 The downstream mixer responds to a differential pressure controller, opening wide for maximum flow velocity to reduce headloss, and closing as flow decreases to enhance mixing. Headloss remains constant throughout. Westfall Manufacturing introduced the Variable Flow Plate Model 2900 for bitumen blending, viscosity and density control in 2010. 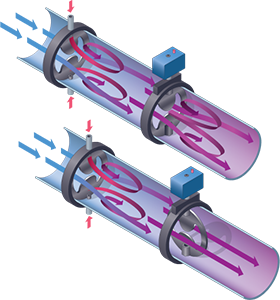 The device mixes multiple diluents to the correct viscosity and density, and allows pumping over a wide range of flow rates. The Westfall Model 2900 is a high shear plate-style static mixer which achieves a low CoV (coefficient of variation) of injected diluents. Because it is capable of achieving a uniform concentration of injected materials while sustaining specific pressure loss criteria downstream, the Model 2900 reduces consumption of bitumen diluents. The CFD report from Alden Labs shows that this mixer accommodates flow rates at up to a 20 to 1 turndown ratio. The Westfall Model 2900 Variable Flow Static Mixer for bitumen blending, viscosity, and density control combines two wafer-style static mixers to achieve a low CoV (coefficient of variation) of injected diluents. 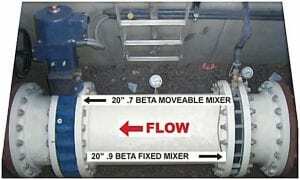 Capable of achieving a uniform concentration of injected materials within a short downstream distance, while sustaining the maximum pressure loss criteria, this highly efficient mixer reduces consumption of the bitumen diluents. This 2900 variable plate transitions from fully closed to fully open according to flow.